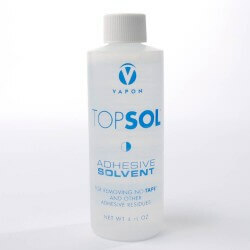 Top Sol solvent adhesive is for removing all types of prosthesis or wig adhesives. 4 oz bottle. Attention : FUEL. Do not use or store near flames. External use . Do not apply on irritated skin. Avoid contact with eyes . Keep out of reach of children. Pre-test areas before use. Do not leave on silicone bases more than 2-3 minutes. Contains organic wetting agents, petroleum, hydrocarbons and Lanolin citrus oils.